Hi all, hope you've all had a good weekend.......oh my goodness was the weather rough when I left for work this morning, could've had an extra 20 mins in bed instead of doing my hair, lol!! 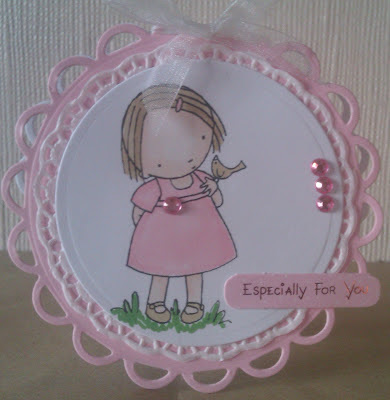 Have used another Heather Ellis image here, coloured hee with promarkers, and mounted onto a doily then the lacy circle, added some gems and a sentiment. There is still a week left to join in with this challenge, as always we love to see your cards! so stunningisa.beautiful pretty image and colours and i love the shape. Awwww adorable card Lisa, love the image & pretty pink. Gorgeous card Lisa, I like the sweet image, the pearls and the shape. That weather really was the pits wasn't it!